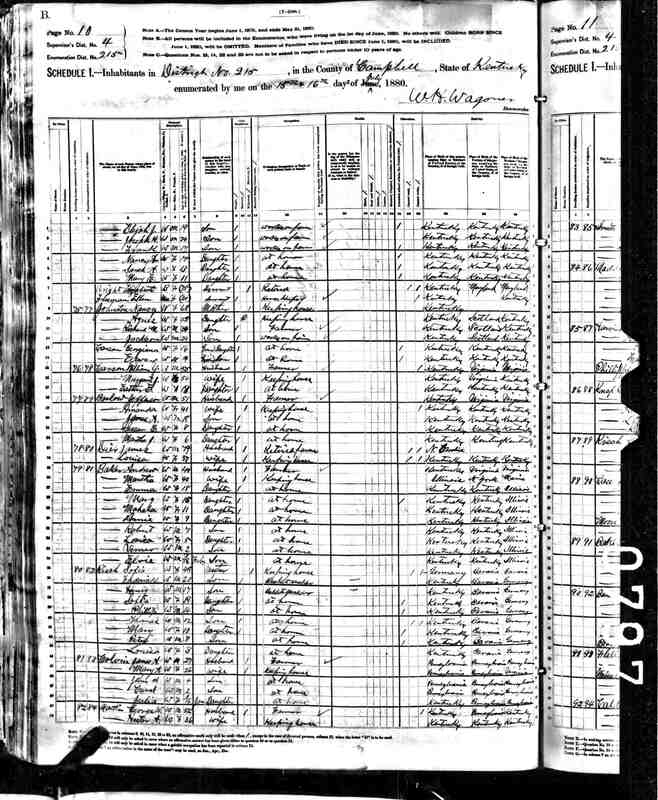 The text below was taken from the Maddox family website (www.birch.net/~gbyron/kin/maddox.html). The line described below is mine starting with Anna Maddox marrying Frank Alexander Caldwell near the turn of the century. The Maddox family line follows up through her father William Columbus Maddox until Notley Maddox Jr. who married Mary Warren. 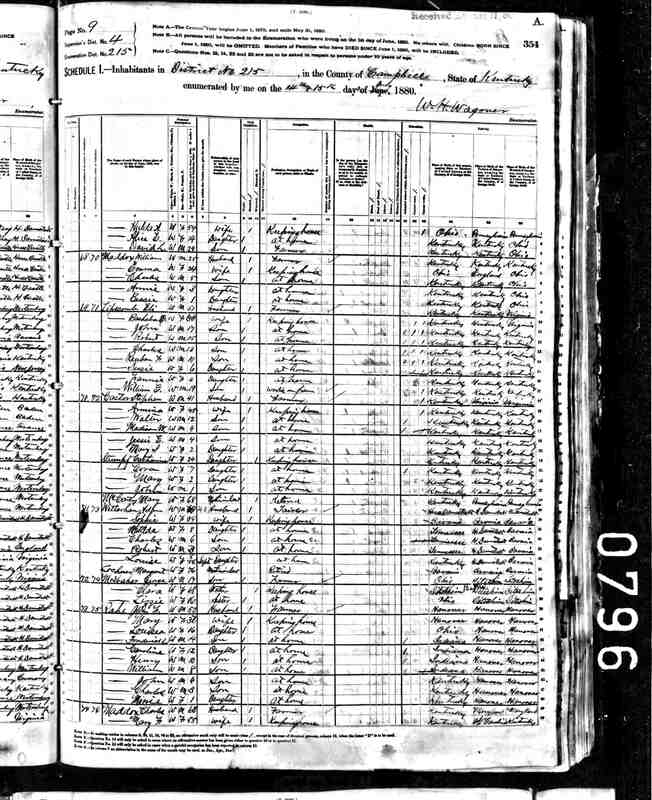 The Maddox's came from Wales with Samuel Maddox who immigrated to Maryland in the 1600's. The Maddox family site explains in great detail much of the Maddox history and its roots back to the middle ages in Wales. The Maddox line starts in America in the early 1600's. The first Maddox settler Samuel Maddox is described below. Samuel Maddox (abt 1644-1683) was born in Wales and he arrived aboard ship in 1665, landing at Maryland's Chesapeake Bay in the settlement which was known as St Mary's City--not far from what is now Washington D.C. Specifically, this line settled on the Potomac River side of the western shore peninsula. Samuel's oldest son, Notley Sr. married Margaret Gerard Goldsmith. The Gerard Family was one of the most prestigious and colorful among Maryland's early settlers, and financiers of the original 1634 expedition of the ships "Ark" and "Dove" --a replica of the "Dove" sails today. One Maddox recently found Samuel's Green Springs Farm homestead! Parts of the Samuel Maddox line also moved to Charles County. My Grandmother was the Great Great Great Grandniece of Daniel Boone. The relation to Daniel Boone has been handed down generation to generation and the original reason why I decided to look into my history was to either disprove or prove this theory. Well I proved it and while doing so discovered very old letters and documents uncovering new people and making sense of how everyone "fit" into my family tree. Digging through my mother's closets and basements we found numerous minor and four major pieces of evidence that I was able to peice together. The Caldwell family Bible (circa 1850), an extreamly old letter written by my Great Great Great Great Grandmother Francis Augusta Lemon (1817), a poem written by the same, and letter written to my grandmother Thelma Caldwell Maul by my Great Great Aunt (1937). Each of these had some very important information critical to proving and discovering the Boone connection. Digital scans of these documents can be found on the Boone page. Along with the very old documents above I stumbled across a six page letter written from my Grandmother's great aunt to my Grandmother in 1937. My Grandmothers Great Aunt was 70 when she wrote this letter. It speaks of her mother and her grandmother. The letter was written for the specific reason of explaining to my grandmother her family history. The letter gives dates and peoples names that prove our relationship to the Boone family. This was also a wonderful find as it filled in blanks when I first started my search. Maddox Family Tree - Boone Line Connection - Pictoral Representation. Click the picture for the blow-up size version. 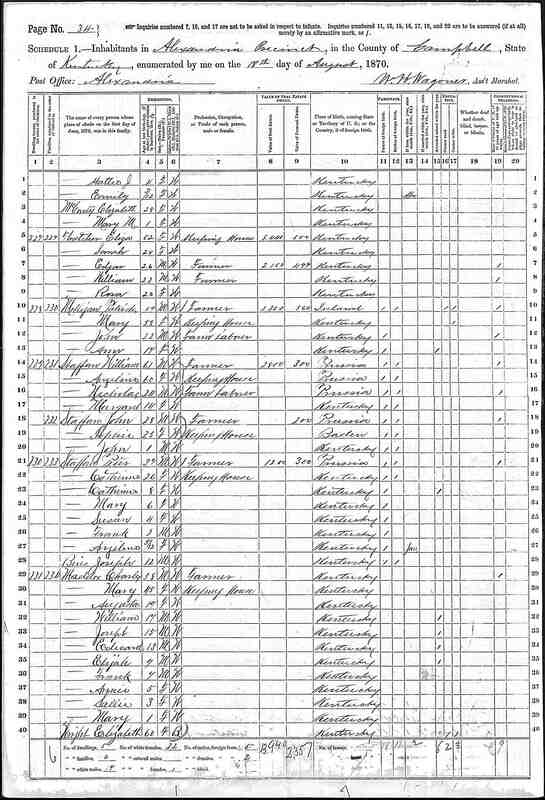 The following link is a portion of my family tree from Boone side. It is a visual representation which I believe is much easier to understand than traditional text trees. This tree starts from my grandmother and continues up through the Boone branch as well as direct cousins and relatives of the Boone line. Known war veterans or important people in history can be noticed by the box surrounding their name. For my relatives this representation is by far the easiest way to view and understand our family tree. The nineteenth county in order of formation, Campbell County is located in northern Kentucky. Covering 152 square miles, Campbell County was formed on December 17, 1794, from portions of Harrison, Mason and Scott counties and named for Col. John Campbell, a Revolutionary War officer originally from Ireland. It has county seats at ALEXANDRIA and NEWPORT. The topography of Campbell County is level to hilly. The rich river bottomlands produce large crops of burley tobacco, corn, hay, and vegetables. Pasture land is extensive, supporting large herds of beef cattle. The woodlands of the county are of mixed hardwoods, including ash, oak, hackberry, black walnut, and red cedar. The major watercourses are the Ohio and Licking rivers. In early history of Campbell County, both Indians and pioneers moved along the Ohio River. Indian attacks were frequent during the settlement era. One of the first settlements in the area was Leitch's Station, built about 1789 by Maj. David Leitch, who fought in the Revolutionary War. In 1803 an army outpost (Newport Barracks) was established at the fledgling community of Newport to supply soldiers during the early Indian wars. This installation also served as a staging area for Soldiers embarking on campaigns during the War of 1812, the war for Texas independence (1836), and the Mexican War (1846-48). Campbell County prospered during the antebellum period. The town of Newport was a contender for the capture of the river trade, but was eclipsed by the rapid growth of Cincinnati. Newport, however, became an important river city, retaining its status well into the twentieth century. Though sentiments for both sides ran high, the Civil War did not severely affect Campbell County, located as it was far to the north. During the war, the county continued to prosper and grow. Industries such as steel, meat processing, and brewing were created, mostly in Newport, which gave residents steady employment. In 1887, following the destruction of the Newport Barracks by a flood in 1884, the army post was moved to higher ground and Fort Thomas was founded. As the post expanded, it eventually absorbed the nearby community of District of Highlands, and in 1914 the town of FORT THOMAS was established. In 1933 and 1937, the 10th U.S. Infantry, which assisted in flood relief, was garrisoned at Fort Thomas. In the late twentieth century the post was maintained by the Brooks-Lawler Army Reserve Center and a Veterans Administration Hospital. Though Newport was chosen as the county seat in 1794, the desire for a centrally located seat of government led to the creation of two county seats. Three courthouses, built in Newport in 1795, 1805, and 1814-15, respectively, served Campbell County until 1827, when the seat was moved to Visalia, along the Licking River. Visalia was located too far from the population center of Newport, however, and the next year the government returned to the river city. It remained there until 1840, when it was moved to Alexandria, the center of the county. Though a new courthouse, completed in 1842, was constructed in Alexandria, the people of Newport, still the population center, built another courthouse in their city in 1883. Since then the county offices have been housed in both locales. Maddox Resting Places - Cemeteries.